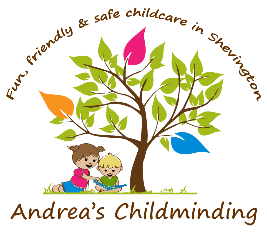 As a childminder I am committed to ensuring that all children in my care are kept safe at all times. I will provide a loving and caring setting that listens to all parents and children and promotes health and safety, wellbeing and personal hygiene. I will ensure that all children are growing up in circumstances consistent with the provision of safe and effective care. I will teach all children the five Every Child Matters outcomes of being healthy, staying safe, enjoying and achieving, making a contribution and economic wellbeing. I meet all my legal responsibilities and obligations by completing all risk assessments accurately and ensure that they are reviewed frequently. Daily house risk assessments will be completed and any outing will be risk assessed beforehand. Other risk assessments such as extreme weather, first aid, health and safety, play equipment and fire safety will also be completed. My paediatric first aid certificate is up to date and I will ensure that I receive recommended further training when necessary. A home fire risk assessment has also been carried out by my local fire brigade service. All accident and incident logs are in place as are fire safety checks, fire drill procedures, smoke alarm checks, food temperature checks, refrigeration temperature checks, healthy menu plans and equipment checks. I provide a separate safeguarding policy file which must be read and understood by all parents. There will be an acknowledgement slip included for every parent or carer to sign to say that they have read and understood all areas of the policy. Also included are leaflets that parents or carers are welcome to take or I can print copies for their own use. These include safe sleeping, bruising, oral injuries, thermal injuries and also a list of telephone numbers that may be useful. I have access to more information leaflets such as emotional neglect or emotional abuse, smoking, alcohol abuse, substance abuse and domestic violence should anyone need me to download copies of these for them.